Well, it seems almost strange to be talking about gingerbread houses with Thanksgiving barely behind me, but here we are. It’s another HUNGRY HEARTS HOLIDAY HOP, and I for one am excited. We’re celebrating the holiday season with mouthwatering cookie recipes and delicious excerpts from today’s hottest food-loving romance writers! Hop around and fill out the Rafflecopter form on each author’s site to enter our giveaway. This time it’s a a spectacular mix of Harry & David Truffles. 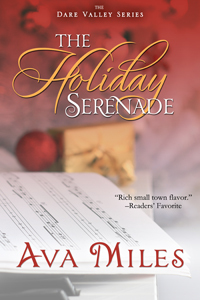 Yum… In addition to the HUNGRY HEARTS HOLIDAY HOP prizes, Amanda Usen will be featuring Hungry Hearts authors on her site and giving their books away to lucky winners so visit http://amandausen.wordpress.com/! I’m going to be featured this week, so check it out! Well let’s get back to gingerbread, shall we? 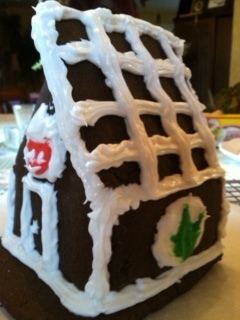 I decided not just to make gingerbread men, but to make a house. But first I have to share the happiest synchronicity EVER. Our family gingerbread recipe is from my great-great grandmother Clara–the wife of my great-great grandpa who won our family newspaper in a poker game in 1892. He’s the man I based Grandpa Hale on in the Dare Valley Series, remember? Well, I was just so darn happy that my mother finally told me that. I mean, we’ve been baking this recipe all my life, and somehow, I never heard it was from Great-Great Grandma Clara until just a few weeks ago. Gingerbread houses make me happy for so many reasons. First, the cookie pretty much knocks flavor out of the park with all of the coffee, molasses, and spice. Then there’s the fact that my mom made gingerbread houses for us growing up, and like Abbie Maven in THE HOLIDAY SERENADE, my Christmas novella, she does NOT allow anyone to eat them. So maybe I made my first ever gingerbread house so I could eat it. 😀 Then there’s the last reason. Since I’m a sculptor, I thought it would be fun to join walls and a roof in something other than clay and goop. Trying my hand at cookie and frosting was a challenge, and I have to say I pulled it off nicely with the lovely Christi Barth (also in our hop) watching me when we cooked together on a recent Saturday. There’s something magical about gingerbread houses. Any time I see one I simply become happy. My inner child wants to dance at the sheer delight of that house, decorated in frosting and candy. So if you want to have some fun and make some memories, try out my Gingerbread House recipe and watch my YouTube video below, showing me decorating it and wishing you all a happy holiday. Christmas only comes around once a year, and I have to say, I’m glad I finally had the impetus to make my own gingerbread house. It might just have become a new tradition. Enjoy! *You can half the dimensions to make a smaller house if you want to start small and practice as you become more adept at assembling. If so, half the frosting recipe too. Bake at 375 degrees for 3-4 minutes on parchment paper (less time if you use the half dimensions). Cook pieces in the oven and let cool on a wire rack. 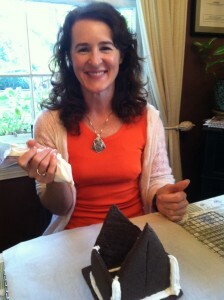 Place the frosting in a pastry bag with a small decorating tip. Anchor the base cookie on aluminum foil or parchment paper and use the frosting to glue it down. Secure the end piece and one side wall with frosting and let dry for 30 minutes after propping up. Remove prop and join other side wall and end piece. Prop up and follow earlier instructions. 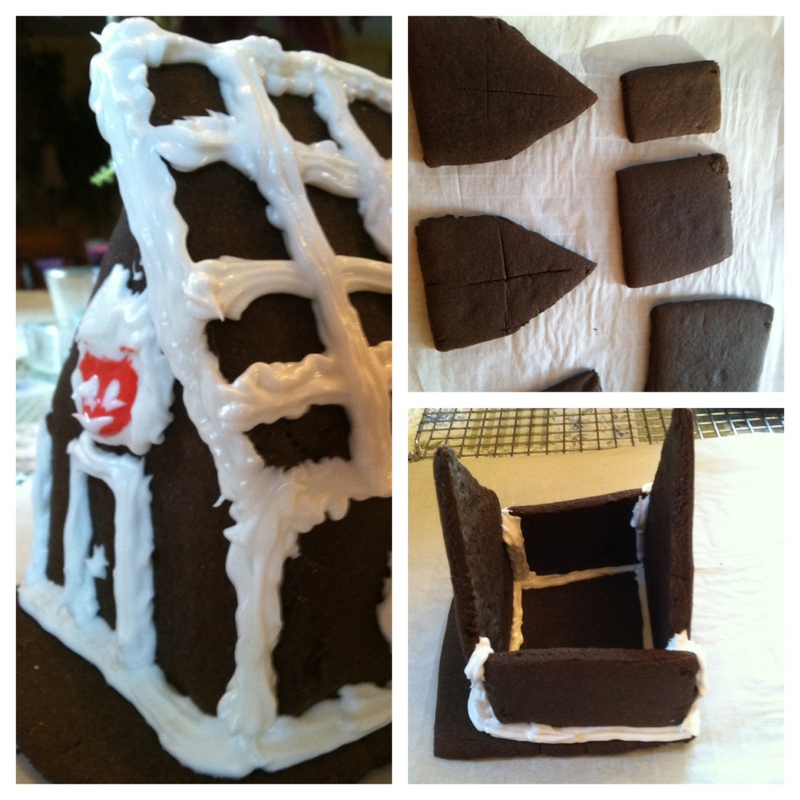 Add the roof next and secure the walls with additional frosting to secure the structure. Then use your imagination. Add whatever seems to work for your house: gumdrops, chocolate Santas, etc. You can also dye the frosting different colors to decorate the house if you want to go wild—like Abbie does. If you have leftover dough, form them into gingerbread men or other shapes and bake at 375 for 8-10 minutes. Rhett suggests you make both male and female gingerbread cookies (sugar sprinkles for sequins optional). What a delicious and warm family tradition. thanks so much for sharing. Helped my grandsons make a gingerbread house using a small milk carton to help with the frame. They loved doing it. Enjoyed your post. Love Gingerbread houses and making them with my daughters. Not sure these are Christmas cookies or not but I love Ranger Cookies. But my favorite Christmas sweet has to be Turtles. Especially when the carmel is overcooked and extra chewy. I do not care for super soft carmel. Make me work for it. gotta say I am a bit intimidated by gingerbread houses. Think I will stick with my favorite men. I love Gingerbread houses! My granddaughter was born on December 26th, so Christmas day, we did a Gingerbread house together and we had so much fun! Would love to read and review one of your books!